A model train geek, learning as he goes. I recorded a video to talk about the car cards I am trying out for my layout. I am going to use it to run through a trial operations session to see how well it works. Here is a completed car card, with a caboose card inserted into the pocket. 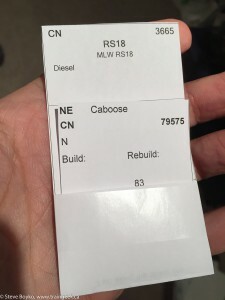 These car cards were generated by the Easy Model Railroad Inventory program, a free program. See this Facebook group for a link to download it. You print several cards per sheet of paper, then cut each card out and fold the bottom up and tape it to make the pocket. The fold lines are printed as part of the card, so it is really easy to put these cards together. For card holders, I cut the tops off envelopes and staple-gunned them to the edge of my layout. That’ll do for now until I put a fascia on, and at that point I’ll look for a nicer card box. Precision Design Co. makes some very nice and inexpensive laser-cut boxes. I used Excel to make the inserts for the cards. The inserts show where the card should go. 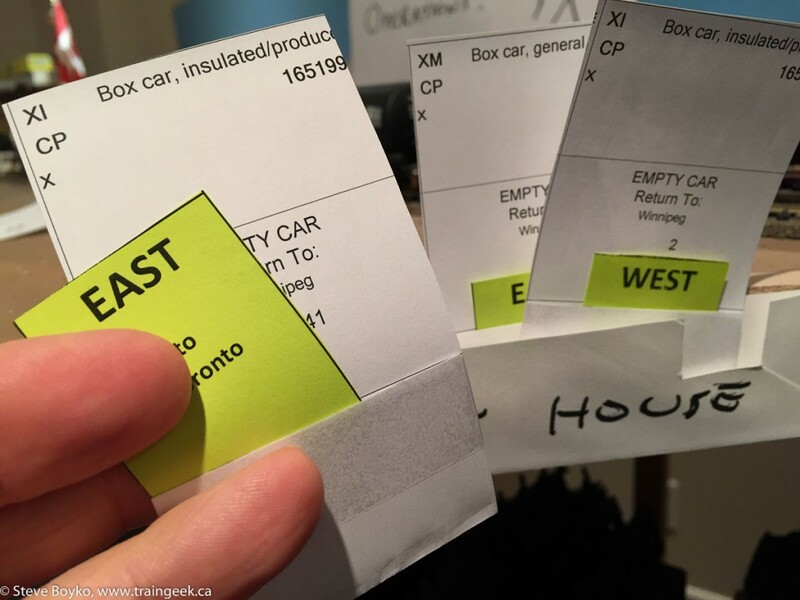 Here’s an example showing an insert “EAST to Toronto”. The intent is to use these to route the cars to their destinations. Once they have arrived, the yellow destination tags are removed and a HOLD tag is inserted to show it is to stay there. Sometime between operation sessions, I’ll replace some of the HOLD tags with destination tags so they’ll get moved in the next session. These destination tags are commonly called waybills. I am using a very simple system…. maybe too simple. Some people use “4 cycle waybills” where there are four destinations on a waybill, and after a car arrives at the currently-shown destination, you flip the card over or upside down to show the next destination. The car will end up cycling between those 4 destinations. This page discusses some other ways to forward cards. That’s the basic idea… we’ll see how it works in the next post. Question: What do you use for a car card system, if any?